The young architects from RAMA Estudio, Ecuador designed the TORNO co-working space in Quito starting from an industrial shed. The young architects from RAMA Estudio, Ecuador designed the TORNO co-working space in Quito starting from an industrial shed. The project, selected for the “Young Architects in Latin America” competition will be exhibited in a collateral event at the 16th International Architecture Exhibition - Biennale di Venezia. Upcycling is the perfect word to describe the idea for the Torno co-working space in Quito designed by the architects from RAMA who were responsible for each stage of the project - siting, design, building the 250-square metre structure and making the furniture. The goal from the outset was to find a decommissioned space to bring it back to the city as a catalyst for change. A place that needed to be in a strategic position and to have enough room to house the programme desired by the client - a co-working space with seven independent offices, 20 co-working stations, cafeteria, meeting room, showroom and laboratories. The choice of RAMA Estudio fell on an industrial shed, where a lathe - or torno - repair shop was located until not long ago. This also gave the project its name, Torno Co.lab. A large structure in the central north part of Quito, easy to get to because it is close to public transport and to the bike path, fundamental for a sustainable project in terms of both cost and environmental impact. Once they found the site, they started on the actual planning work. Torno has been designed as an insert in its container, the shed, exploiting the whole area, and the daylight flowing through the windows in particular. 85% of the material used in the construction is recycled. Plywood and metallic panels, obtained from CKD (a kit containing the parts needed to assemble cars) mostly from Asia, were used as structure and partition wall; timber from pallets sourced from different industries are used in the mezzanine; large pieces of broken glass were modulated and adjusted to the project; the metal doors, which came from the demolition of factories in the downtown, have been given a second life at Torno. The construction system of the co-working space was based on the careful study of available materials to assure maximum stability and safety of the project after a range of structuring tests led to the definition of the sections of beams and pillars used in the assembly. 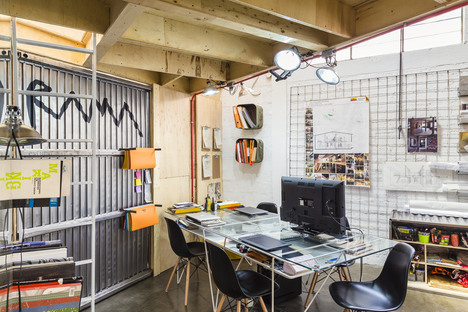 This allowed RAMA Estudio to craft all the spaces required inside the shed, minimising cost and impact. Most of the furniture in Torno Co.Lab was also designed and built by RAMA, giving the whole environment a warm, welcoming feel, without relinquishing the post-industrial appeal of the original workshop. The project by RAMA Estudio was selected as part of the “Young Architects in Latin America” exhibition and will be exhibited in a collateral event at the 16th International Architecture Exhibition - Biennale di Venezia.